There are text reminders for everything from doctor appointments to haircuts these days, and now they're being sent for court appearances. A company called Uptrust provides a system to send those reminders to defendants. The Tulsa County Public Defender is now working with Uptrust, and they’re even taking the concept a step further. While Uptrust founder Jacob Sills was in business school, he spent some time in bail hearings — for research purposes, of course. What he saw was judges and prosecutors crunched for time deciding defendants with a history of missing court were a flight risk and setting high bail. Sills said around 80 percent of those defendants, however, had public defenders. "And so, the idea that they were missing court because they were going somewhere seemed crazy to me, and as we dug deeper, it was, like, 'Wow. People are missing court because they forgot they had court,'" Sills said. "Or they didn’t know they had court because they didn’t get the reminder because they moved around a lot. Or they had child care issues or transportation [issues]." That lines up with what Tulsa County Assistant Public Defender Glen Blake sees. "Our office is appointed to represent people that have been determined to be indigent by the court. So, you know, things that a lot of people take for granted, just like having a car or even just having a friend that can take them to court or being able to come up with bus fare — it’s something that our clients face every day," Blake said. And when people miss court or can’t pay bail, they end up in jail until trial, often for a long time. 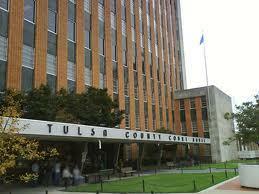 The estimated median jail stay before trial for a nonviolent misdemeanor in Tulsa County is 30 days. "They’re losing their job. They might have already lost their job, their place to live. Sometimes kids go into DHS custody. It’s just — pretrial detention is just very, very damaging to people’s lives," Blake said. The specter of a long stint in jail can even make Blake’s job tougher. "Clients are much more likely to plead guilty to a charge that they may even have a valid defense to if they know that their guilty plea is going to result in them getting out of jail that day," Blake said. That’s where Uptrust and the Tulsa County Public Defender’s Office come together. The public defender is now using the software to remind clients about court appearances via text message. "It’s not perfect in the sense that not every single person has a cell phone. But one of the things that’s really interesting is the rate of cell phone ownership and even smartphone ownership has gone up dramatically among low-income individuals," Sills said. According to Pew Research, 92 percent of Americans earning less than $30,000 a year own a cell phone. Sills said that’s translated to results. "Roughly speaking, the failure-to-appear rate in a lot of jurisdictions is somewhere between 15 to 20 percent. We’ve seen that we’ve been able to decrease the failure-to-appear rate to between 5 and 10 percent," Sills said. And in Tulsa County, Uptrust and the public defender’s office are adding to the system’s potential. The public defender's office won a grant through the MacArthur Foundation’s Safety and Justice Challenge for it. "Our innovation that we actually proposed was to include Family & Children’s Services so that we would be able to reach out to clients, notify them of court, but also give them the opportunity to be able to get resources — whether it’s transportation, child care, elder care — to help them also get to court," Blake said. It’s a setup Sills wants to see replicated in other places. "Family & Children’s Services actually has a social worker that’s sitting inside the public defender’s office. And where that’s really impactful is they’re not only assisting with the collection of information, they’re receiving referrals from attorneys and able to use Uptrust to message defendants around available services," Sills said. Blake hopes using Uptrust helps cut Tulsa County’s pretrial detention rate but said being able to connect defendants with social services offers another measure for success. "The personal experiences and the ways that we’re able to help people just even on a smaller scale, day to day, I see those as a huge success," Blake said. Grant funding for the system will cover one year. The goal is showing Tulsa County officials Uptrust saves enough money to pay for itself so they write it into future budgets.